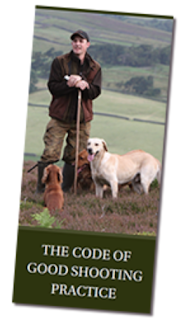 Have you read the Updated Code of Good Shooting Practice, 2017, yet? The SGA is delighted to have been be part of this revised Code, which sets out the benchmarks for maintaining the highest standards. Game management and conservation help shape and enhance our landscape. Wildlife thrives where land is managed for shooting. Over a million people are involved in shooting; many more enjoy the end product as consumers of pheasants, partridges and other game. Moreover, shooting makes a substantial contribution to the rural economy – often at times and in places where other income is scarce. Shooting is worth £2 billion to the UK annually and £200m to Scotland each year. But the good name of shooting depends on everyone involved following this Code. Whatever your role within shooting, you should always be ‘Code-aware’ and raise awareness of this Code in others. Please also make yourself aware of the revised Code to Game Handling. Ensuring the best game ends up on the table, in a way which meets all food safety requirements, is critical. The appetite for game meat is growing. By maintaining the highest standards, we can ensure more and more people are enjoying high quality, healthy free-range game.